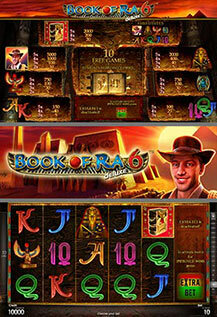 Discover a new dimension of additional chances in an even mightier Book of Ra™ deluxe 6! Choose the 10-line, 6-reel variant of the famous video slot classic and play with Extra Bet on Extra Reels for Extra Thrills. BOOK OF RA substitutes for all symbols except the scattered SPECIAL EXPANDING SYMBOL of the feature. An additional 6th reel can be activated via EXTRA BET in the base game only and will be active in the free games as well. 3 or more BOOKS OF RA trigger 10 free games, and open to randomly reveal a SPECIAL EXPANDING SYMBOL that expands to cover all three positions on the respective reels and pays on any position. Free games can be won again during the feature and are played at current bet.